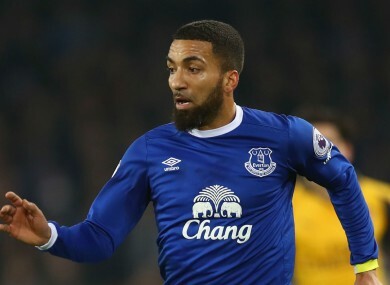 EVERTON AND FORMER England midfielder Aaron Lennon has been detained by police under the Mental Health Act and is receiving treatment for a “stress-related illness,” the club confirmed on Tuesday. The 30-year-old, who has not played for the English Premier League club since 11 February, was taken to hospital on Sunday after police were called to an address in Salford, Greater Manchester. “Officers attended and a 30-year-old man was detained under Section 136 of the Mental Health Act and was taken to hospital for assessment,” Greater Manchester Police said. Everton released a statement Tuesday. “Aaron Lennon is currently receiving care and treatment for a stress-related illness,” the statement said. “The club is supporting him through this and his family has appealed for privacy at this time”. Base Soccer Agency, who represent Lennon, tweeted their support. “Everyone at Base Soccer sends their support to @AaronLennon12 – get well soon and stay strong”. Former England cricket captain Andrew Flintoff, who has battled depression, tweeted: “Lots of love and wishes @AaronLennon12 another cruel example of how mental illness can affect anybody, get well soon x #Timetotalk”. Lennon joined Everton from Tottenham Hotspur in September 2015 for £4 million ($5.2 million, 4.7 million euros). He has been capped for England 21 times and played at the 2006 and 2010 World Cups. Under the Mental Health Act, police can detain people to assess whether they need urgent treatment for a mental health disorder and if they are a risk of harm to themselves or others. Email “Everton's Aaron Lennon receiving treatment for stress-related illness”. Feedback on “Everton's Aaron Lennon receiving treatment for stress-related illness”.